December 2012: received engine (1995 Mustang 5.0), it looked enormous with the SN95 accessories. I had to later change all of the accessory brackets and most of the accessories to Fox parts in order to clear the frame rails. Last edited by Rob7 on January 3, 2014, 10:17 am, edited 1 time in total. What are your plans for controlling your fuel injection? 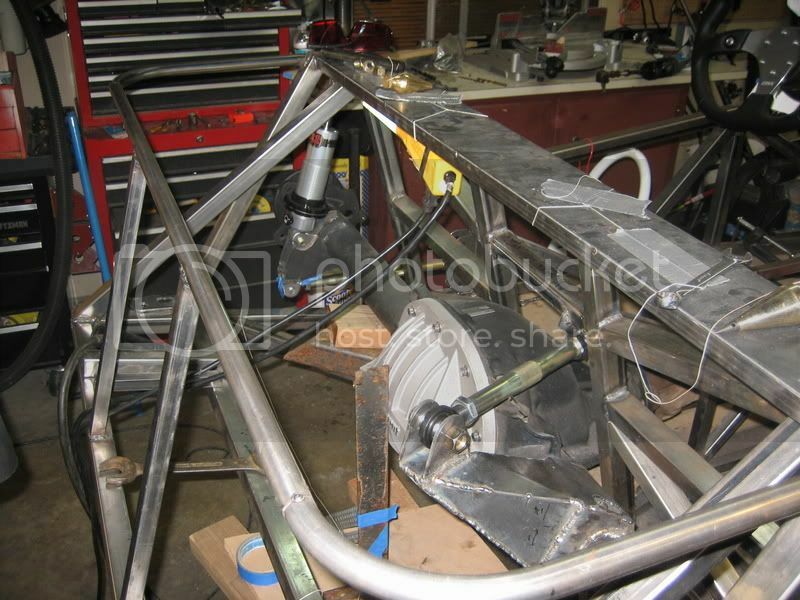 April 2013: started frame-side engine mounts. Cut Mustang brackets off rear end. Started transmission tunnel. July 2013: figuring out rear end top link. I had originally planned to have a 4-link with panhard rod, but I read about binding issues and was forced to redesign. Started center tunnel diagonals. I want to make sure the driveshaft will never be able to reach the occupants. Saw this Lotus 7 when wifey and I drove up to talk to guy about welding a bracket onto the differential housing. He had a Lotus 7 in for some work. Pictures never give the same impression as seeing the car in person. In person, the car looked like a 'normal' car, just built on a smaller scale. The overall shape looks balanced, and I like the look of the clamshell fenders more seeing them in person. The car didn't seem too much smaller than how I imagine a finished locost to be. We each had a chance to sit in the car, and it felt very normal to me: snug but not at all cramped. The seat was comfortable, probably OK for longer drives, reminded me of the seats in a MG Midget. September 2013: Miata seats I had bought on eBay don't fit with the wider center tunnel, even after removing the reclining mechanism. They are also from a smoker's car. I aired them out quite a bit, but they still have a slight odor. I'll use Kirkey seats instead of these. If anyone would like to come pick them up for very cheap, I'd definitely like to free up the space they're taking up. Started replacing the engine accessories with Fox parts. Had to replace the timing chain cover so I could use the Fox water pump. Due to the Mustang body design change in 94?, the SN95 accessories are moved back and to the sides of the engine. The Fox accessories clear the frame much better. October 2013: received Mustang II knuckles (2" drop), 11" rotors, GM calipers (I think). Also, I'll be using Moog K772 upper ball joints for the upper and lower ball joints on my build. More work on the bracket attaching the rear top link. Panhard rod and brackets almost done. Engine accessories brackets mostly done, except for needing to adjust fore/aft position on the alternator. Seems like the Foxes had V-belts rather than 6-rib belts, so I had to fudge the alternator bracket spacers to get it lined up. The A/C compressor is rebuilt; it seems that there aren't any more new ones in this style (surprising). 15" Sport Edition F5 wheels (plus the spare). Yokohama S.Drive tires 205/55r15. Outer diameter: 23.88"
November 2013: "Eibach Pro Spacer" wheel adapter spacers, Aluminum, 30mm Thick, 70.50mm Center Bore, 5 x 114.3mm. Used hubcentric rings underneath: inner diam 63.4mm , outer diam 70.4mm. The 45mm (?) offset wheels need spacers to clear the frame in the rear. Removed most of the surface rust from the frame, did some grinding and welding. Redid some tubes in the driver's footwell. Cut some tubes and added new ones to make more room around the bellhousing. Easy and fun stuff: flywheel, starter, clutch. I got the lightest-duty clutch I could find. Flywheel is billet steel for better driveability. I may have put the engine bay diagonal tubes too close to the engine. There are several inches on either side, and I'm hoping that's enough to allow the engine to shift normally under load. Any thoughts? Adding triangulation for the top link frameside bracket: This shows the (in progress) passenger side tubes. I'll add the same on the driver's side. Tubes are 1" x 16ga. Looks to me like you have plenty of clearance. More than my car, and I don't have any interference issues. Not with the engine, at least. BTW, I really like the trailing link brackets on your rear axle. I thought about doing something like that myself, but it looked like a lot of work and I'm not putting out nearly as much hp as you will be. That's funny because that upper link is the only thing I don't really get. I never like to tell someone they are wrong because in most cases they are just different. Actually that is the case here also. The only suggestion I have would be to adapt the upper attach point of the 3 link to the rear cover of the differential. I have seen them use that area for attaching torque arms on some fairly high horse cars and it seems to work quite well. It would free up a lot of space on the top of the diff and save a few pounds at the same time. Even made of 1/2 plate it would be quite lite after being all cut out. Enjoying what you have done so far and will be following with interest. The biggest thing in motocross. All 3 of your links are way too short, this is an issue with Locost frames. I suggest you re-engineer your brackets to go towards the rear of the car as far as you can to get some length into them to stop the rollsteer they suffer. Secondly, get your top link over to the right as far as it will go within the tailshaft opening - assymetrical power delivery requires assymetrical linking. Lastly, with the top link over to the right you will want a little anti-squat to make it worth the effort, the front of the top link needs to be lower than the rear (or vice versa) either side of 1", it would be nice to have adjustment holes that you can test with. Run you panhard rod from the right side of the axle as low as practical angling up to the left side of the frame (driver's side USA) for the same reason. I strongly advise a panhard bar choice to help balance the torque you will have. 4 links don't bind if set up properly. Nick47 - thanks, the brackets I did for the three link were indeed a lot of work. I wanted them to look nice, but I'm going to have to scrap them and redo them anyway. Egoman - I was never too crazy about how I attached the upper link. I thought for a while about attaching it using the diff cover bolts, but those are only 3/8" or so in diameter and would be stressed in tension/compression. Also, the differential cover will be aluminum. Cheapracer - thanks for the advice - everything is already welded up, but I want to redo the brackets anyway, mainly to have longer links like you suggested. I'm reconsidering using a 4 link + panhard setup but with rubber bushings in the top links. With the 3-link, the top link is always either intruding into the passenger area or interfering with the gas tank (or too short in my case). Plus there's no decent mounting point on the differential housing. If I use rubber bushings in the top links and try to keep all of the links as long as possible, maybe I won't have to worry about binding? And lastly I can angle the existing panhard rod up and to driver's side to compensate for the torque roll. To me this sounds realistic, but perhaps I am missing something? Here are some ideas for extending your top link. Ignore them if your satisfied with your current setup. Cut off your existing brackets and fabricate a new mount that will take the link mount rearward, similar to Rod's 5.0 Locost, but much simpler. Do this by using the two stock, top suspension bushing mounts on the differential (red arrows) plus either (a) mounting to a reinforced, drag racing diff cover (photo) or (b) fabricating a 3/16"-1/4" flat spacer under your current diff cover to provide the rear triangulation point for a home-made top mount. That won't help with your lower links, of course. You could angle the bracket to left or right as needed for torque effects. File comment: There are many of these available from different manufacturers. File comment: Use 2 stock upper suspension mounting points from 7.5. Thanks Lonnie-S, good ideas - I'm not really happy with my current set up, and I'm leaning towards redoing all of the brackets and links anyway. I didn't ream some of the holes properly, so I might as well. And I'll be able to get much longer links at the same time. I'd like to keep the adjustable panhard rod to compensate for torque roll. So that means I can't use the angled top link as Rod did. If I instead run the top link straight front-back, then it'll be very difficult to fit the longer link without running it way into the passenger compartment or having to notch the gas tank (Rod did that for his angled top link). I'm hoping to use a fuel cell, and cutting into it is probably out of the question. So, I'm thinking of just using a 4-link setup with rubber bushings on 2 or 4 of the links and being done with it The 3-link has not been feasible space-wise, and I'd really like to get away from that configuration. where the key message is that four-links won't bind in roll if they are not parallel. Another thing that has always befuddled me is why when you what a longer link you don't move the bracket forward on the frame. This isn't just you Rob, it seems to not be something people consider. You can put your instant center where you want it with either setup. We are far from building exact seven replicas so the desire to put it where lotus put it is unnecessary.